← Nike+ Heart Rate Monitor – June 1st!? I have been meaning to blog about Dean Karnazes for a long time, but just never got around to it. Simply put he is amazing. Dean is hands down one of the best endurance athletes on the planet, but that is only half of the story. His ability to motivate and inspire people on a mass scale is unbelievable. It you don’t believe me that Dean is “the man”, just check him out on Wikipedia. 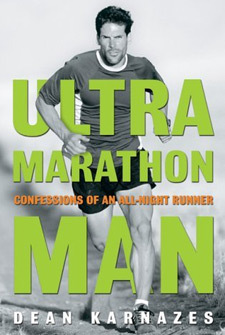 Then I picked up the documentary DVD Ultramarathon Man: 50 Marathons – 50 States – 50 Days. The title is pretty self explainatory, but yes, he ran 50 marathons in 50 states in 50 consecutive days. It is a really inspiring and motivating film. I highly recommend it. 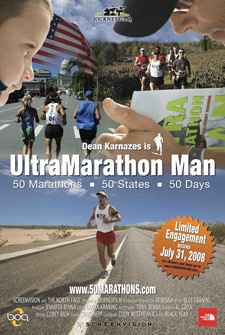 This entry was posted in Books, Running and tagged Dean Karnazes, Ultramarathon Man. Bookmark the permalink. Yes, we have all 3 in 1 DVD which include ‘Running the Sahara’ as well.